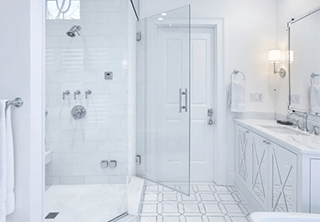 “X” marks the spot in this traditional homes’ bathroom with a transitional twist. Trieste marble counter top with a combination of honed and polished water jet floor. Note the slight grey accent with the white marble. 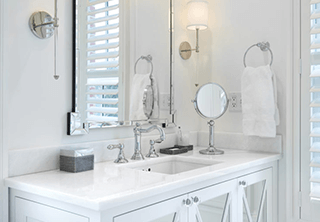 Note the vanity’s mirror accents with the polished and honed marble floor. See more at StamfordWatersideDesignDistrict.com.